Both the Marathon and Half Marathon routes are recognised as officially measured routes of 26.2 miles and 13.1 miles respectively. Each mile will be marked out along the route to count you down to the finish line. The majority of the course is flat and tarmac road, making it the perfect event for those athletes wishing to complete their first ever marathon. Where the running route is off road, such as Greenway, the surface is still solid, smooth and safe to run on. The town centre of Stratford-upon-Avon marks the start of the race and from there, you will loop around this picturesque town before heading out in an anti clockwise direction into the English countryside. Aid and refreshments stations will be positioned along the course to quench your thirst. You'll then return back in the town centre to roaring cheers from friends, family and well-wishers encouraging you along the way for those final few miles to the finish line! 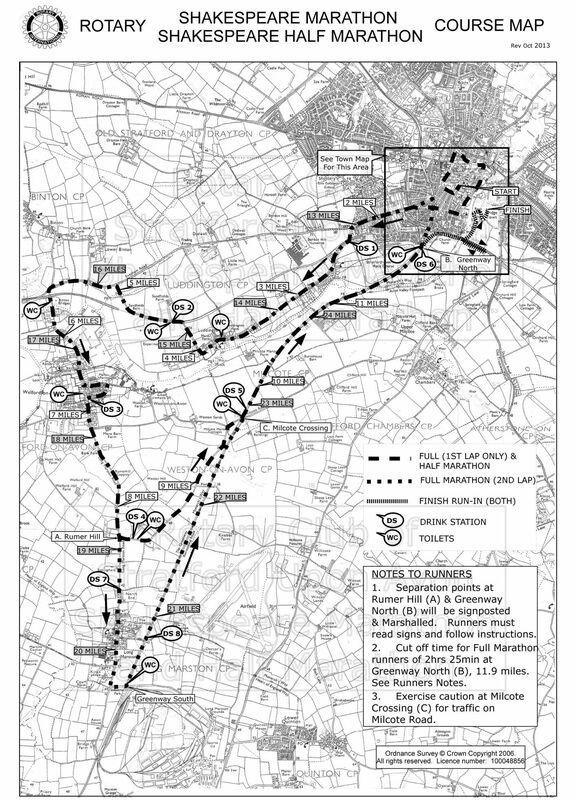 Please note that those runners competing in the Full Marathon must reach Greenway North (11.84 miles) within 2 hours 25 minutes. If not, they will be re-directed to finish the Half Marathon instead. There is a cut of time of 6 hours to complete the route. If you are still on the course after this time, you will be withdrawn from the race and are subject to your own responsibility. If you're travelling to the event by car, please allow 15 minutes to walk from the main car parking area (near the recreation ground) to the start area in the town centre. From 7am to 9am there will be an Information Desk located near the start line, on the High Street, at the entrance of Debenhams Store. Please note that the Information Desk will be relocated to the Main Marquee on the recreation ground once the race has started. Runners packs are all sent in the post, unless an entry is from overseas or they enter after lunchtime on the 24th in which case you can collect from the Information Desk. Please remember your chip and number, as without these you cannot participate. Make sure you number is visibly fastened to the front of your top. Accomplished runners are advised to arrive early should they wish to secure a front spot in for the start of the race. Parking is available in the town near the recreation park and finish line. Look out for the entrance of Swans Nest Hotel or use the post code CV37 7LT for Sat Nav Directions. Please see the map for further details. There are additional multi-storey paid car parks available near the event in the town centre. Please note there will likely be delays on departure. If a speedy exit is required, we would advise using one of the additional car parks rather than the main car park near the recreation park. All spectators are welcome. With so many things to do and see in Stratford-On-Avon, why not make a weekend out of it! Is there a cap on entries? Yes, for safety and logistics, numbers are capped at circa 3,700. When should I enter and how? Given the entry limit and fact that no entries are taken on the day, we'd recommend entering as soon as possible. The easiest and quickest way to enter is online. Please note that no refunds are possible, nor can entries be transferred or extended to the next year. Yes, every 2 miles or so there will be drink stations. Whilst bottled water will be available, isotonic drinks will not be handed out. There will also be refreshments available at the finish line. For safety reasons, running headphones are not permitted. Anyone found to ignore this request may be disqualified. Do I get my race number, chip and information in advance? Yes, all of these items will be sent to you in the post ahead of the event and you should receive them by Thursday 25th April 2019. If, by Friday, you haven't then please get in touch. Please note that if you enter the race after 12pm on Wednesday 24th April 2019 then you will need to collect your race pack at the Information Desk (outside Debenhams) on race day. Those who are entering from abroad are also required to collect their race pack from the Information Desk on the event day. Showers and changing rooms are provided at the finish line. For Men, these are at the District Council Pavillion and for Women, these are located at the Boat Club. Bag storage is also available at the Sea Cadet's hut and any items left here are subject to your personal responsibility. Toilets are available at both the start and the finish line. As much of the course takes place on public roads, please be conscious of any hazard such as traffic or road works. Both toilets and water stations are located throughout the route. Self propelled wheelchairs are not permitted along the route. Subject to the Race Director's decision, athletes who wish to push wheelchairs may be allowed. Please contact the Race Director to discuss further. There will be doctors at the finish line (recreation ground), along with first aid from St John's Ambulance. A sports injury specialist will also be present for any injured participants at the end of the race.There's also medical support across the course. Please make sure you are adequately prepared for the race both mentally and physically. If you are questioning your ability then please do not start the race. The Course Doctor will have the final say and if you are requested to exit the course you must abide by these instructions. It is also advisable to check that you have suitable personal insurance coverage. Note: It it vital that you write on the back of your race number any existing medical conditions and an emergency contact number. It is is also recommended that all runners write their name and address. If you're looking to find out your race finish time or how another athlete did, you can check the provisional results which will be posted by the finish area. The official results will also be available to view online at www.frsystems.co.uk a few days after the event. If you'd like your results posted, this is also possible for the fee of £1 on the day. Further details can be found at the Information Desk. I ran the Shakespeare half for the second time in 2018, the online registration process was simple and efficient with an entry fee of £29.00 is reasonable, however you don’t get a finishers shirt or goody bag, event tech, cotton shirts & hoodies are available at the race village.Pre-race information was fine and arrived in plenty of time. the event centre & finish are situated on the fields near the cricket ground along with chaning rooms toilets & bag drops. The actual start is in the town centre of the beautiful Stratford upon Avon, a short walk from the event village. The route itself meanders around the town centre for the first couple of K it can be a bit congested, there are no start line pens so marathon & half marathon runners are all mixed together with the potential for some of the faster runners being further back than there pace would suggest, venturing out of the town on to main roads around 4K, the traffic management seems to work well, early on there a few minor undulations but nothing too serious. Water stations are positioned approximately every 3 miles, they are well staffed by friendly efficient marshals handing out small bottles of water. 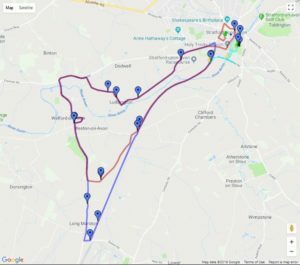 The route is well marked, spectators are mainly around the start and finish areas, the outlying villages are also well supported with well-wishers who are enthusiastic and full of good cheer. There is a bit of a more challenging climb at 12K, it goes on for around a K, with the steepest section in last 200M. there was a bit of traffic trying to pass on the hill, not a real problem and seemed to sort itself out once we had reached the top, following the summit there is a short steeper downhill. At 16K you head off road on what is probably an old railway line, the track is mainly gravel and makes a nice change from the tarmac. At the end of this there is a short section on the road segregated from the traffic by cones, its a bit narrow but doesnt last long a quick switchback and you are soon following the river and heading back in to the finish area. The finish area is great with loads of loud good spirited spectators families and friends, a real village fete feel to it, medals, bananas and water are handed out by well organised volunteers as you cross the line. A refreshment tent stocking a good selection of cakes and drinks also offers a free drink to all runners. A hot food stall has the usual mix of burgers, hot dogs and pork rolls. All in all a very friendly well run event, exceptionally well organised and a real family feel to it with marshalls and volunteers in abundance. I was not too sure what to expect from the Shakespeare Half, as I was told that it was not the most exciting...Turned up with thousands of others trying to squeeze into Stratford Upon Avon, luckily they is loads of parking spaces, just not that many working pay and display machines...The start was in the middle of the town on Church Street, with tudor buildings either side of the crowds, we proceeded to do a loop of the town centre, coming down along the river, before heading west out of the town, running down past scores of supporters out cheering us on, we then turned down a lane towards Luddington, a very wealthy looking hamlet, with big posh houses. By this time the sun had come out. From here it appeared to be a slow but gradual incline, twisting around the lanes, until reaching the main road again, after a short stretch a sign appeared "Concealed brow ahead", which could only mean one thing - DOWN HILL. It was a good sight from the top, out across the fields, but more importantly down, down and down. Another left turn down a lane over a little bridge and through the picturesque village of Welford on Avon, dodging all the cars and vans trying to get past us. Here again the countryside opened up, to the fields and beyond, turning onto the Greenway, an old railway line, which was covered in light gravel, Stratford was in sight, again there were loads of supporters out on this section of the route, and as we neared the end of the race course the sprinklers were on, and the slight shower was well received, as by now the sun was out and the temperature was getting hot. On arriving back into Stratford, there was a short section back on the road before doubling back down a track and into the playing fields, and snake around to the finish. Here there were thousands of supporters all cheering, not sure if the commentator was awake he didn't sound it!! A great course which I would do again, slightly crowded towards the start, loads of water stations, supporters and very well organised, another medal to hang on the wall, no t-shirt and no goody bag here, but there was a very welcomed free cup of tea. Oh and the bacon and egg buttie after went down a treat. I ran the Shakespeare half for the first time in 2017, the online registration process was simple and efficient with an entry fee of £28.00 is reasonable, however you don’t get a finishers shirt, but can but various tech & cotton shirts & hoodies.Pre-race information was fine and arrived in plenty of time. The actual start is in the town centre of the beautiful Stratford upon Avon, a short walk from the parking and bag drop which is handily in the same area as the finish. the route itself meanders around the town centre for the first couple of K, venturing out of the town on to main roads around 4K, the traffic management seems to work well, early on there a few minor undulations but nothing too serious. Water stations are positioned approximately every 3 miles, they are well staffed by friendly efficient marshals handing out small bottles of water. The route is well marked, spectators are mainly around the start and finish areas, the outlying villages are also well supported with well-wishers who are enthusiastic and full of good cheer. their is a bit of a more challenging climb at 12K, it goes on for around a K, with the steepest section in last 200M, following the summit there is a short steeper downhill, if you like hills you won’t even notice it. At 16K you head off road on what is probably an old railway line, the track is mainly gravel and makes a nice change from the tarmac. At the end of this s sort section on road segregated from the traffic by cones followed by a quick switchback, then following the river and soon heading back in to the finish area, which is located on the fields behind the Stratford Sports Club. The finish area is great with loads of loud good spirited spectators families and friends, a real village fete feel to it, medals, bananas and water are handed out by well organised volunteers as you cross the line. A refreshment tent stocking a good selection of cakes and drinks also offers a free drink to all runners. those more peckish can feast at the hot food stall. All in all a very friendly well run event, exceptionally well organised and a real family feel to it. I'll try and keep this brief, but in essence this is just a lovely race from start to finish. I was suppposed to be runing the marathon, but some weeks ago I suffered a knee injury and knew that my chances of completing the 26.2 miles was next to nothing. So, I changed to the half. This was easy to do by contacting the organisers! Plus points already! My wife was running this and was hoping for it to be her first half without injury, so I decided to run with her and see if we could get her a good PB. And we most certainly did! More on that later... We arrived in plenty of time for a change (we were actually early leaving! For us, that's a miracle!). It was busy, but the parking was fine (apart from the cost - £6 for 9 hours. The next option down was going to be a bit tight on time. VERY expensive if you ask me). In fact the spot we parked in was literally 100 yards from the finish line. I guess one slight downside for me is that it's a 9am start. Makes it a very early morning, and at this time of year I think it could start a little later. So, having arrived in plenty of time it was also fantastic to have proper toilets to use! There were also plenty of portaloos (another first at a race!). The start was in the town centre, so a bit of a walk from the car, but it gave chance of a little warm-up stroll (or run if you felt like it). The start line was heaving!! We were quite a way back from the actual line (not that it matters when it's chip timed). The announcers on the tannoys were a bit irritating, waffling on about something or other than no-one could hear properly, despite the volume! Anyway, before we knew it (and without a countdown of any kind that we could hear) we were off!! Despite my suggestions to slow down my wife appeared to be on a mission and went out like a rocket! We weren't far off her PB pace at 5km, and she actually smashed her 10k PB when we reached that! The course is lovely. Starting out around the town centre there was loads of local support. It was really very impressive and great to hear and see. Then we headed out into the countryside. The course is pretty flat. Just one or two inclines (in my book anyway. I heard several people complaining later about that "awful" hill!! It really isn't a hill to speak of!) One thing worth mentioning is the water stations. These were great and frequent enough for anyone, but I would maybe suggest that the tops are removed from the bottles (I know not everyone would agree) but it meant for lots of bottle tops all over the road and they were really quite dangerous. You step on one of those and you're all over the place. Accident waiting to happen. On the plus side was something I've not seen before and a brilliant idea. Sponges!!! Lovely cool wet sponges to get a bit of moisture on yourself. All races should do this. Brilliant!! The course continued through the countryside and soon joined the Greenway, which is an old railway line. Now gravelly, so really takes it out of your legs. Still a lovely run, but does get a little narrow in places. Finally we approached the town again, and the marathon course split off to do another lap (with a 2 hour 20 minute cut off at this point which I thought was a little harsh. That will exclude a lot of people from taking on the marathon). The last mile seemed to go on forever! There's a bit of an out and back on a road, then path, and on entering the back of the park there's another little loop back on yourself. It's still green and lovely by the river, and again the support was absolutely amazing. We gave it our best up the final straight and over the finish line, even getting our names shouted out by the announcer as we finished! Nice touch! My wife had smashed her half PB by nearly 13 minutes. Getting the 10k PB as well was a bonus! On finishing we received another bottle of water and a banana along with a lovely medal. To top it off the fantastic ladies in the refreshment tent were giving all runners a free cup of tea! Now that's a fabulous idea. Really loved that. We stayed on to cheer in the other runners and saw the very impressive winner of the marathon come in. Prizes were announced as and when they were found, rather than a big ceremony, which was also a pretty good idea so people didn't have to wait around for ages. When we were ready to go it was just a hop skip and a jump back to the car. The traffic out was pretty busy, but hardly surprising. All in all it was a really great race, and I'll happily give it another crack next year. Might go for a PB myself next time! Congrats go out to my fellow Hook Norton Harrier club members with some great performances and PB's. First time I had run this half marathon - it was an early start (kicked off at 9am) but well organised from the off. We were able to park in the car park right next to the finish, and only a few minutes walk from the start. The parking was a tad pricey but given the close proximity to everything, this wasn't too much of an issue. There were proper CLEAN toilets at the car park (bonus) with warm water and everything to wash hands in (*gives contented sigh) - luxury!! The walk / run to the start was a nice warm up and the atmosphere around the town centre was great. The only slight niggle was the volume of the loud speakers which were deafening, especially if you were stood close by. The route was lovely - started in town and quickly wound it's way through Stratford and out to the countryside. Lovely views, and lots of support from local villagers when we passed through. The route was fairly flat - one small hill which was more of an incline really, but tough if you aren't used to them. The gravel path of the Greenway on the way back into town made a nice change though quite tiring on the legs when you've already run 10miles. There were a couple of water stops and whoever thought of providing water soaked sponges is clearly a genius. There was loads of support at the finish which was great, and a nice medal. There was a refreshment tent providing very reasonably priced drinks and food for spectators, and a free drink (squash, tea or coffee) for runners. Again - genius! A cup of tea at the finish line was just what I needed! The whole event was one of the most well organised events I have been to. I enjoyed the route (give me coutryside and views over 13miles of town any day!) and the lovely touches such as the sponges and cuppa at the finish made it stand out as being an excellent event. Hi there, Are bone conductor headphones allowed please? What is the cut off for the half marathon please? Hi there! Bone conductor headphones are allowed and the cut-off time for the half marathon is 3 hours. Good luck!